DPP4 is a dimer of two identical subunits, colored blue and green here. Each contains two domains: the domains at the top of each subunit are involved in interacting with other extracellular proteins, and the domains at the bottom carry the catalytic triad. Have you ever wondered how our bodies maintain a perfect balance, making sure that each cell has the resources it needs? This balance, termed homeostasis, is accomplished by continual communication and cooperation between cells in different parts of the body. For example, all of our cells require glucose for energy, and a complex network of hormones ensure that it is delivered to the places it is needed. When we eat, cells in our digestive system secrete incretin hormones, letting the body know that glucose is going to be available. These hormones travel to the pancreas, which releases insulin into the blood and signals to cells around the body, such as muscle cells and liver cells, to take up the glucose and store it for later use. When glucose levels drop between meals, the hormone glucagon tells cells to release glucose from their energy stores. The complementary effects of insulin and glucagon, controlled by the level of incretins, ensure that the proper level of glucose is always available for use. Since hormones control the minute-by-minute functions of the body, their signals need to be carefully regulated as conditions change. 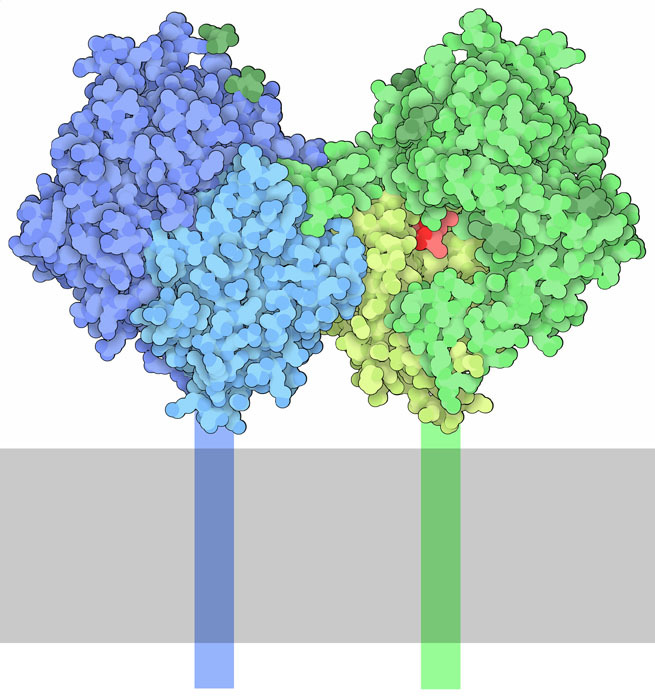 Dipeptidyl peptidase 4 (DPP4, also known as CD26), shown here from PDB entry 1nu8, helps with this regulation. It is a membrane-bound protein that acts as a dimer of two identical subunits. It is found on the surface of cells throughout the body where it plays several roles: it interacts with many other proteins, playing important roles in processes such as cell signaling and inflammation, and it inactivates several different hormones, including incretins, by clipping off two amino acids from their ends. Because there is so much DPP4 around, incretins only circulate for a few minutes before they are inactivated, allowing tight communication between the incretin-producing cells in the intestine and the insulin- and glucagon-producing cells in the pancreas. DPP4 cleaves the amide bond of hormones with proline or alanine at the second position from one end of the chain. The cleavage reaction is performed by a catalytic triad of amino acids very similar to serine proteases such as trypsin and elastase. A serine performs the cleavage reaction, which is made more chemically active by nearby histidine and aspartate amino acids. Two acidic glutamates assist with the reaction by holding tightly to the free amino end of the hormone, locking it into position. DPP4 is one of the few enzymes that can cleave next to a proline, because proline fits perfectly into a hydrophobic pocket in the active site. Understanding of the interactions between the DPP4 and its hormone substrates has laid the groundwork for developing inhibitors of DPP4. Substrates and inhibitor of DPP4. In the four substrates shown here, the two amino acids at the end, colored blue or green, will be clipped off and released as a dipeptide. Exendin-4, with a glycine at the second position, acts as an inhibitor. DPP4 breaks down peptide hormones such as incretins, neuropeptide Y (PDB entry 1ron), and chemokine eotaxin (PDB entry 1eot), ensuring that they are only active when needed. These hormones share a similar structure, with proline or alanine at the second position. The two incretin hormones, glucagon-like peptide-1 (GLP-1, PDB entry 1d0r) and glucose-dependent insulinotropic polypeptide (GIP, PDB entry 2b4n), have been of particular interest because they provide a way to treat type-2 diabetes. People with diabetes mellitus have dangerously high levels of glucose in the blood because of low levels of insulin. One approach to treatment is to inhibit DPP4, so that incretins act for longer, stimulating production of insulin. Medical researchers have approached this in two ways. First, they have developed analogs of GLP-1 or GIP that cannot be broken down by DPP4. For example, the drug exenatide was developed from exendin-4 (PDB entry 1jrj), a natural incretin mimic found in the venom of the Gila monster. These molecules circulate through the blood longer, stimulating production of more insulin to help reduce diabetic blood sugar levels. Unfortunately, these incretin analogs are typically small proteins and need to be injected. The second approach uses drugs that can be taken orally to block the action of DPP4 directly, allowing natural incretins to circulate in the blood longer. In 2006, the Federal Drug Administration approved the first of these DPP4 inhibitors, sitagliptin (PDB entry 1x70), which was quickly followed by many other anti-diabetic drugs collectively known as “gliptins.” All of these drugs mimic the end of the incretin hormones, blocking the active site of DPP4 so that it cannot inactivate the hormones. To explore six different gliptins and an analog of one of the DPP4 substrates, click on the image for an interactive JSmol. 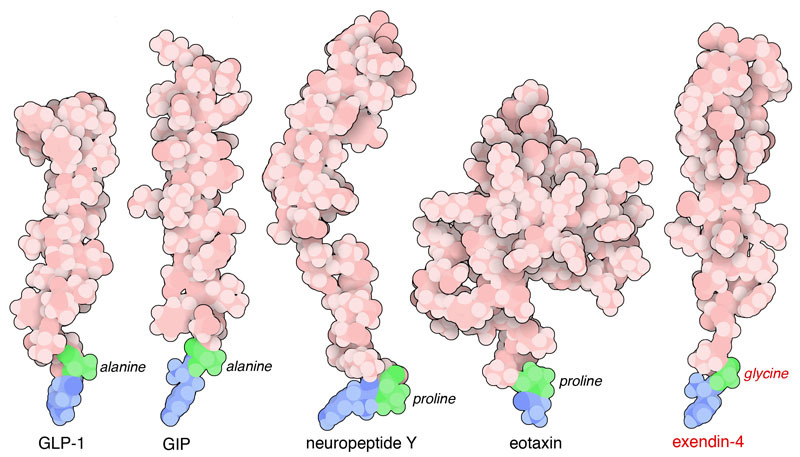 Structures for several other hormones that are cleaved by DPP4 are available in the PDB, including peptide YY (2dez) and chemokine RANTES (1rtn). Take a look at these and find the dipeptide that is cleaved by DPP4. You can use the Protein Feature View of DPP4 to see the portions of the enzyme that are not included in the structure. D. Rohrborn, N. Wronkowitz & J. Eckel (2015) DPP4 in diabetes. Frontiers in Immunology 6, article 386. 3w2t: M. Nabeno, F. Akahoshi, H. Kishida, I. Miyaguchi, Y. Tanaka, S. Ishii & T. Kadowaki (2013) A comparative study of the binding modes of recently launched dipeptidyl peptidase IV inhibitors in the active site. Biochemical and Biophysical Research Communications 434, 191-196. H. Zhong, X. Rao & S. Rajagopalan (2013) An emerging role of dipeptidyl peptidase 4 (DPP4) beyond glucose control: potential implications in cardiovascular disease. Atherosclerosis 226, 305-314. 3vjk: T. Yoshida, F. Akahoshi, H. Sakashita, H. Kitajima, M. Nakamura, S. Sonda, M. Takeuchi, Y. Tanaka, N. Ueda, S. Sekiguchi, T. Ishige, K. Shima, M. Nabeno, Y. Abe, J. Anabuki, A. Soejima, K. Yoshida, Y. Takashina, S. Ishii, S. Kiuchi, S. Fukuda, R. Tsutsumiuchi, K. Kosaka, T. Murozono, Y. Nakamaru, H. Utsumi, N. Masutomi, H. Kishida, I. Miyaguchi & Y. Hayashi (2012) Discovery and preclinical trials of teneligliptin (3-[(2S,4S)-4-[4-(3-methyl-1-phenyl-1H-pyrazol-5-yl)piperazin-1-yl]pyrrolidin-2-ylcarbonyl]thiazolidine): a highly potent, selective, long-lasting and orally active dipeptidyl peptidase IV inhibitor for the treatment of type 2 diabetes. Bioorganic and Medicinal Chemistry 20, 5705-5719. 3g0b: Z. Zhang, M. B. Wallace, J. Feng, J. A. Stafford, R. J. Skene, L. Shi, B. Lee, K. Aertgeerts, A. Jennings, R. Xu, D. B. Kassel, S. W. Kaldor, M. Navre, D. R. Webb & S. L. Gwaltney (2011) Design and synthesis of pyrimidinone and pyrimidinedione inhibitors of dipeptidyl peptidase IV. Journal of Medicinal Chemistry 54, 510-524. 3bjm: W. J. Metzler, J. Yanchunas, C. Weigelt, K. Kish, H. E. Klei, D. Zie, Y. Zhang, M. Corbett, J. K. Tamura, B. He, L. G. Hamann, M. S. Kirby & J. Marcinkeviciene (2008) Involvement of DPP-IV catalytic residues in enzyme-saxagliptin complex formation. Protein Science 17, 240-250. 2rgu: M. Eckhardt, E. Langkopf, M. Mark, M. Tadayyon, L. Thomas, H. Nar, W. Pfrengle, B. Guth, R. Lotz, P. Sieger, H. Fuchs & F. Himmelsbach (2007) 8-(3-(R)-aminopiperidin-1-yl)-7-but-2-ynyl-3-methyl-1-(4-methyl-quinazolin-2-ylmethyl)-3,7-dihydropurine-2,6-dione (BI 1356), a highly potent, selective, long-lasting, and orally bioavailable DPP-4 inhibitor for the treatment of type 2 diabetes. Journal of Medicinal Chemistry 50, 6450-6453. 2b4n: I. Alana, J. C. Parker, V. A. Gault, P. R. Flatt, F. P. O’Harte, J. P. Malthouse & C. M. Hewage (2006) NMR and alanine scan studies of glucose-dependent insulinotropic peptide in water. Journal of Biological Chemistry 281, 16370-16376. 1x70: D. Kim, L. Wang, M. Beconi, G. J. Eiermann, M. H. Fisher, H. He, G. J. Hickey, J. E. Kowalchick, B. Leiting, K. Lyons, F. Marsilio, M. E. McCann, R. A. Patel, A. Petrov, G. Scapin, S. B. Patel, R. S. Roy, J. K. Wu, M. J. Wyvratt, B. B. Zhang, L. Zhu, N. A. Thornberry & A. E. Weber (2005) (2R)-4-oxo-4-[3-(trifluoromethyl)-5,6-dihydro[1,2,4]triazolo[4,3-a]pyrazin-7(8H)-yl]-1-(2,4,5-trifluorophenyl)butan-2-amine: a potent, orally active dipeptidyl peptidase IV inhibitor for the treatment of type 2 diabetes. Journal of Medicinal Chemistry 48, 141-151. 1nu8: R. Thoma, B. Loeffler, M. Stihle, W. Huber, A. Ruf & M. Hennig (2003) Structural basis of proline-specific exopeptidase activity as observed in human dipeptidyl peptidase-IV. Structure 11, 947-959. 1d0r: X. Chang, D. Keller, S. Bjorn & J. J. Led (2001) Structure and folding of glucagon-like peptide-1-(7-36)-amide in trifluoroethanol studied by NMR. Magnetic Resonance Chemistry 39, 477-483. 1jrj: J. W. Neidigh, R. M. Fesinmeyer, K. S. Prickett & N. H. Andersen (2001) Exendin-4 and glucagon-like-peptide-1: NMR structural comparisons in the solution and micelle-associated states. Biochemistry 40, 13188-13200. 1eot: M. P. Crump, K. Rajarathnam, K. S. Kim, I. Clark-Lewis & B. D. Sykes (1998) Solution structure of eotaxin, a chemokine that selectively recruits eosinophils in allergic inflammation. Journal of Biological Chemistry 273, 22471-22479. 1ron: S. A. Monks, G. Karagianis, G. J. Howlett & R. S. Norton (1996) Solution structure of human neuropeptide Y. 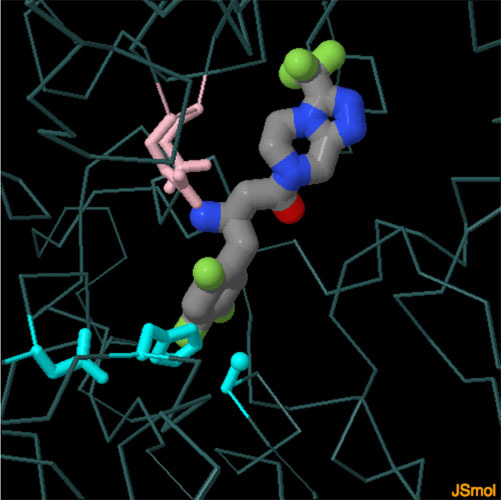 Journal of Biomolecular NMR 8, 379-390.